Stewardship as money and talent... So, What can kids do in worship? Well what can you dream? Pastor Heather Roth Johnson led the children in making prayer paraments for Lent to go on the altar AND kids saying the words of institution with me for first communion. How do you think this will effect their life-long faith formation??? Looking for timely, relevant, family friendly stewardship resources?? 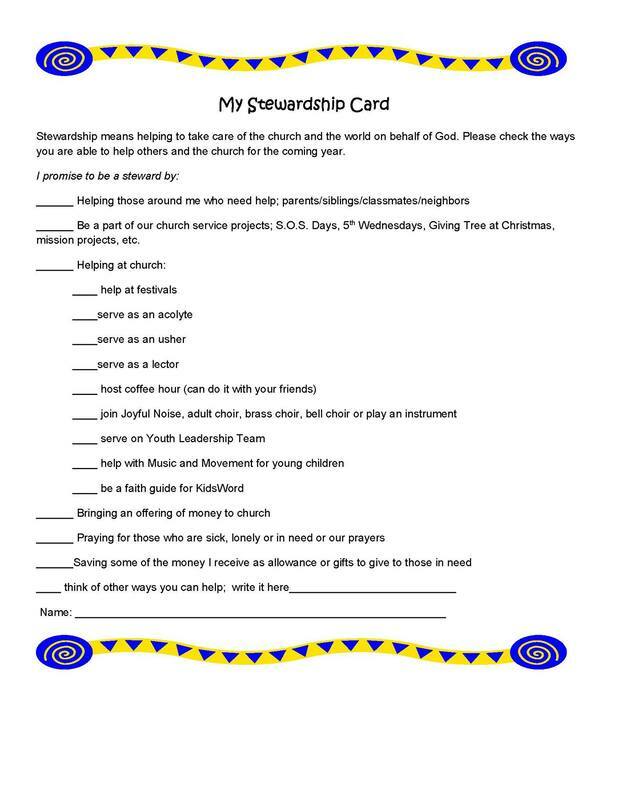 Check out what Holy Cross Lutheran in Illinois has for stewardship resources. Then feel free to contact them about adapting the resource for your context! Raising Helpful Humans - Sparkhouse offers suggestions for chores children and youth can do. Teaching your kids to do chores is a good idea, not just because it helps you but also because it helps them! Tips for teens about money from Thrivent Financial. inFaith Community Foundation - offers a suite of resources to share your giving journey with future generations; including a children's book for purchase. The mission of Share Save Spend® is to help individuals and families develop healthy money habits that honor their values and enhance their financial wellbeing. Storypath - Storypath is a website that connects children's literature with our stories of faith. Check these out specifically geared towards stewardship. Preparing kids for the financial jungle! Bill Dwight created Famzoo, the easiest way to get money to your kids without spoiling them. Check out this helpful youtube video to learn more. ​Here are 21 tips for raising Money Savvy kids at every educational age. Church Closing Litany - Part of Stewardship is knowing where to use one's resources which includes death and rebirth of ministries. This litany from the Church of Canada for a closing of a church can also be adapted for preschools. Talking with young people about stewardship and where to begin found in a quick blog post here. Do you give pledge cards to children? - If not, why not? Learn simple steps to invite children and youth into their baptismal promises.